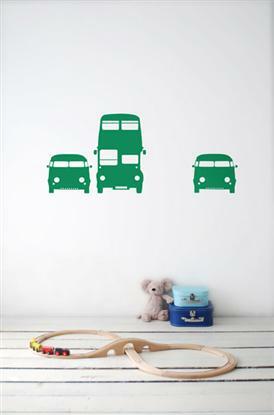 Wall Stickers are a fun way to be creative with your children. All wall stickers are removable and leave no marks on the walls. They are easy to apply and can completely change the style and the mood of a room in minutes. Enjoy the transformation. These fabulous Rush Hour stickers are available in green and turquoise Dimensions: 50cm x 50 cm size adjustable Delivery is by Express Post all over Australia – prices are in FAQs on the website. First sticker is $9.85. Two stickers is $15. Three stickers is $19. We encourage all customers to try to see these products in person whenever possible. The digital pictures we display have the most accurate colours possible, but we cannot be responsible for individual monitor settings. Please visit our showroom, to make the appointment contact us.